Yesterday I was one of many lucky educators at Charles Sturt University for the "Co-constructing Contexts for Meaningful Engagement" Conference. That this was no ordinary weekend conference was evident when one looked around during the keynote address: many of the best and brightest in early learning were there from PDSB and from all around Southern Ontario. 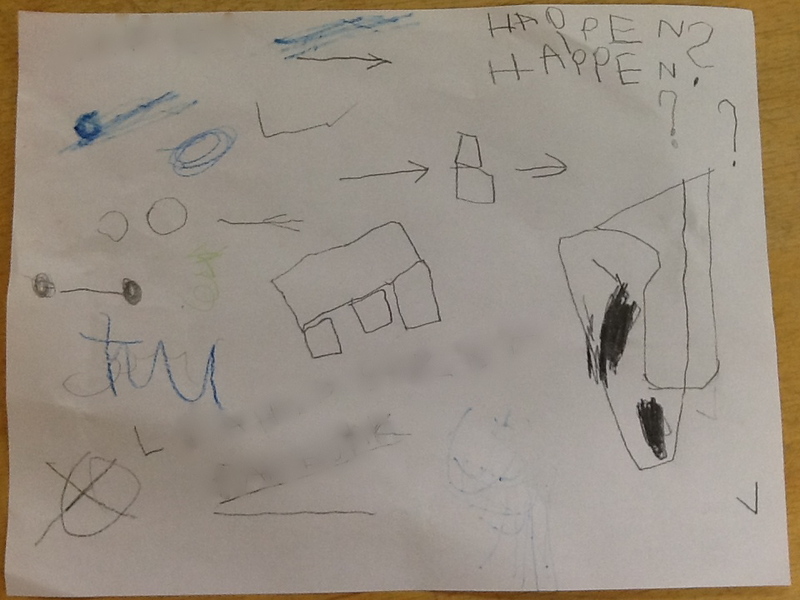 A quick glance around confirmed to me that my once-lonely path on the way to embracing an emergent curriculum Kindergarten was now a warm and welcoming party full of like-minded educators. 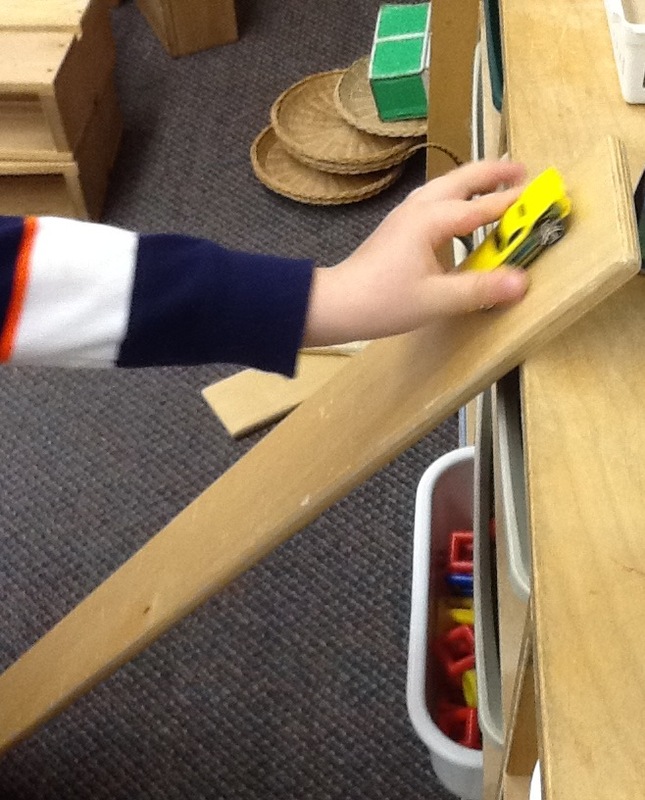 Making a ramp for a favourite car from home. "This year's conference will focus on the contexts and relationships that support a transformation of our view of children, e.g., moving from a model of teachers-learners to a concept of co-learners; expanding the notion of 'classroom' to include the role of resources, materials, and the environment in promoting engagement". The day would have been worthwhile even if only for the workshop sessions in the afternoon, but the morning started with the keynote speaker Lilian Katz, a woman who has spent her long career challenging educators to go beyond imposed curricula, to uncover the innate brilliance in young children. A woman who has inspired everyone that I look up to in education. I regret that I didn't realize how influential she is until now, when I began to connect the dots. I remember having read her work quoted in many articles and books in the last few years, during my first two Kindergarten AQ courses, in blogs of educators I follow. Arguing against the idea of teachers (or schools) deciding the content of what is important for our students to learn, she invited us to consider that our job is to help children to "make better, fuller, deeper, more accurate sense of their own experience and environment". Another way she described it was like this: "strengthen their innate nosiness". I like that. Children are curious about how things work, why they are the way they are, what effect their actions have on the people around them. Emergent curriculum, or to use Lilian's preferred term, the project approach, allows children to deeply explore what is in their environment, what they may interact with, and what matters to them. My main take-away from her talk was a new way to look at the power of children's innate ability to learn. She described a child who had made a new discovery but didn't know exactly how to record what they just found out: "Show me how to write this!" he said. He, like all students immersed in deeply satisfying play, "learned the academic skills in service of his interests". 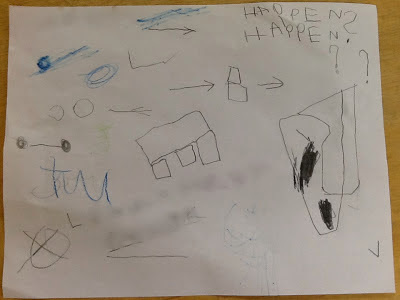 A child's science experiment at home: S drew the materials (a snowball put into the freezer at home), wrote "What happens?" and brought to school to share. Another reason to anticipate attending the conference was that I knew I would have a chance to re-connect with many colleagues I hadn't seen for some time, and also to meet several people from my online PLN (personal learning network). Through twitter and Pinterest I have been able to connect with like-minded professionals around Ontario, and the world over. Indeed, many of us were live-tweeting the keynote highlights as Lilian's words challenged our thinking or resonated with deeply-held conviction about project work. Naturally, I began to look around the room: who had their devices open? Who was on twitter? Over the day I was able to put faces to names and even wound up with hugs. A shout out to those I was happy to finally meet: Nancy @World_of_k, Tracy @TracyPick, Joanne @joanne_babalis (whose workshop was wonderful!). I was able to introduce friends to my wonderful AQ instructors (Kindy parts 2 and 3) who were presenting a workshop down a few doors from the engaging instructors who'd taught me Kindy part 1 nearly four years ago. All these people whose inspiration and support allowed me to feel free to take risks, to try to do things differently, in order to make room for project-based learning to take over most of my program. I continue to mull over the ideas I heard, the challenges put forth, and the notes I took. The rest of the day was another post in itself, with workshops lead by Dr. Carol Anne Wein and Joanne Babalis, and with three of us newly met twitter friends framing our teaching approach in a new way, as inspired by what we'd heard that day: a new 3R's for emergent curriculum. But that is another story. Great summary! It also stood out to me when she gave the example of a child who says "show me how to write". It is so true that when children have a GENUINE purpose to write, read, draw etc...they are more intrinsically motivated. That was a moment, huh? I remember a bit of a murmur in the room when Lilian spoke about that. I have to admit I also loved your post - I think she left us all changed for having been there, but with so many great vignettes and thought-provoking statements, it's no wonder that we have different take-aways. The fact that they built in the discussion group time after her speech illustrates that the conference creators knew we'd need time to process and talk it over before taking on any new ideas.